Hi folks. Sorry for the long hiatus between Franalysis posts. I’m sure the desire to read more of my Franalysis has been excruciating and I’m truly sorry to have deprived you of it for so long. It’s been busy times at work and, frankly, I didn’t have the stomach to go back and re-watch the Rutgers, Wisconsin and Nebraska games in order to do the possession tracking. But I finally finished them off this week so I have about 750 tracked possessions across 11 games (Minnesota through Nebraska), about a third of the regular season. Again, what I did was record the lineup that Iowa had on the court, the type of defense that Iowa played (press, man, zone, transition etc.) as well as the outcome of each offensive and defensive possession - so no box score statistics. I often omitted possessions at the end of games where Iowa was behind and fouling to try and extend the game because I don’t think they tell us much about our actual defensive style and abilities. There is a lot of data in here for me to write about. It’s too much, actually, for one article. So I will write a few of these during the offseason in which we will examine various aspects of the data (individual player efficiency etc.). I view my data set sort of like a cadaver in an anatomy class (Franatomy? ), we will come back to it repeatedly and dissect different parts of it. The cadaver analogy extends to the team’s play during the last four games of the regular season as well, come to think of it. Iowa went 5-6 and scored 788 points while allowing 820 points over the 747 possessions that I tracked across 11 games. So our net scoring differential was negative, courtesy of back-to-back-to-back blowout losses to Ohio State, Rutgers and Wisconsin. It’s unfortunate that my data set does not extend back further into the stretch of the season where we were playing our best (i.e., between the Purdue and MSU games) to see whether the trends that I spotted during my 11 game sample extend more broadly. I’ll try to do some possession tracking during those games as well during the summer doldrums, if I can get ahold of the game recordings. For now, though, let’s look at what happened during the late season swoon. Prior to the second Rutgers game (so after the Ohio State loss / Fran tirade), many of the readers (and authors) of GIA noted that something had seemed off with the team over the last couple weeks and that a potential collapse was looming if our play didn’t improve. We looked great in wins over Michigan and at Indiana but in the four games that followed, despite going 3-1, we looked vulnerable in wins over NW, Rutgers and Indiana. We basically trailed for most of those games and then went on a late run to come back and win. In my past Franalysis articles, I focused mostly on the effectiveness of various defense types (man/zone/press) but today I’m going to focus on player combinations because I noticed a very striking statistical trend in my 11-game sample. This trend actually preceded the tailspin, which began at Ohio State, but I think it gives insight into why many of us were so nervous that another collapse was imminent. The trend was this: our starting five (i.e. the combination of Bohannon, Moss, Wieskamp, Cook and Garza) were very ineffective in the games that I tracked, including the seven games at the beginning of my dataset when we went 5-2. Figure 1 shows the +/-, in points per possession (PPP), of our starting five (blue) vs. all of our other lineup combinations (red). Those “other lineups” contain combinations that include starters. It literally refers to all of our lineup combinations except for this specific one: Bohannon, Moss, Wieskamp, Cook and Garza. As you can see in figure 1, the other lineups generally outperformed the starters by a pretty significant margin, until the Ohio State game at which point they became extremely ineffective and they stayed that way until the end of the regular season. Against Nebraska, the starting five suddenly roared to life with a spectacular +/- of 0.5 PPP. I don’t know whether that was an outlier as I didn’t track possessions in subsequent games. I was busy searching for images of peacocks to use next season. From Minnesota through the Wisconsin game, the lineup combination of JBo, Moss, Wieskamp, Cook and Garza was outscored by an average of 0.24 points per possession. A +/- of 0.24 PPP is really, REALLY bad. In a 75 possession game, that will get you beat by about 20 points. That combination played together for an average of 19.3 possessions per game so they were digging us a four or five point hole pretty much every game. The reason why we were able to win five of the eleven games is that the ensemble of player combinations that weren’t JBo, Moss, Wieskamp, Cook and Garza collectively outscored their opponents by 0.19 points per possession in the five games that we won. Considering that these “non-starting five” player combinations collectively played about 72% of our total possessions, they were able to overcome the ineffectiveness of our starting five. This is not a case of one outlier skewing the numbers either. In the ten games from Minnesota through Wisconsin, our starting five was outscored every time with the exception of the Northwestern game where they narrowly outscored the Wildcats. Over the entire data set, our other lineups were about 0.14 PPP better than the starting five, and that includes the Nebraska game. The fact that our starting five performed this poorly over an extended stretch of games (nearly 1/3 of the regular season) is quite disconcerting. I didn’t track possessions in games prior to the Minnesota game so I don’t know if this trend extends further back. 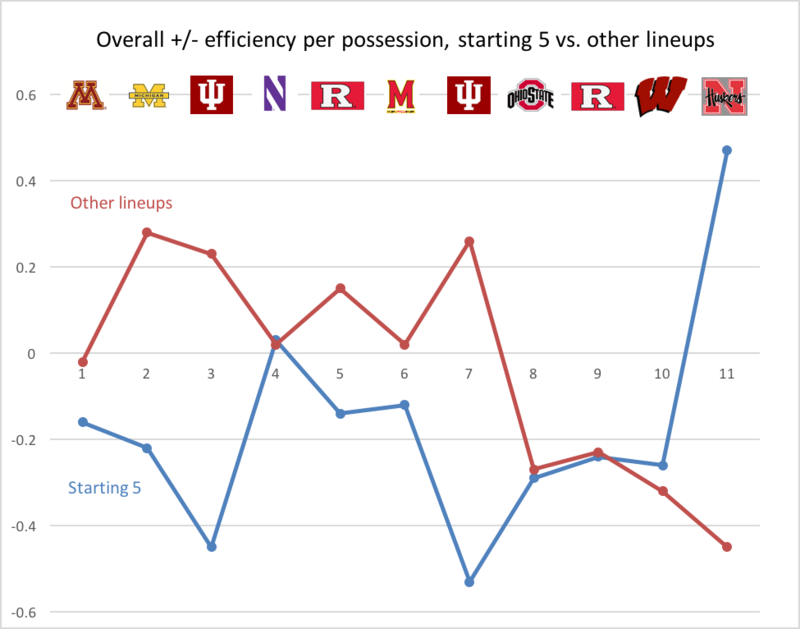 As noted above, our starting five was brilliant against Nebraska (outscoring them by an enormous 0.5 PPP), so perhaps the preceding ten games were not representative of the whole season. However, if this was a season-wide problem, I think Fran either needs to change the starting lineup or he needs to change his pre-game and/or half-time routines or do something (scripted set plays to start the game? sorcery?) to prevent this from happening. One other thing that I noticed was the sheer number of different player combinations that Fran uses. My pivot tables (btw, thanks to my wife for teaching me how to use those) tell me that we used 75 different player combinations in the games that I tracked. That might be an overestimate, due to double counting, but it isn’t off by much. For example, there were nine different lineup combinations that featured the McCaffery-Dailey backcourt that we all loved so much. Most of these lineup combinations were used for 10 possessions or fewer over the course of the 11-game sample so each game is largely a piecemeal of MANY different lineups and it’s not the same ones from game to game, either. When we hosted Indiana, the starters played 17 possessions together, total, in the entire game. The remaining 57 tracked possessions were played by 17 other player combinations! I don’t know how it would be possible to practice with all of these different combinations but the bottom line is that, in spite of limited on court time together, they somehow managed to dramatically outplay the starters during the games that I tracked, for the most part. Now you are all probably wondering if the difference in effectiveness between our starting and non-starting lineups is due to consistent differences in offensive efficiency, defensive efficiency or both? That’s a great question. I was wondering that myself. 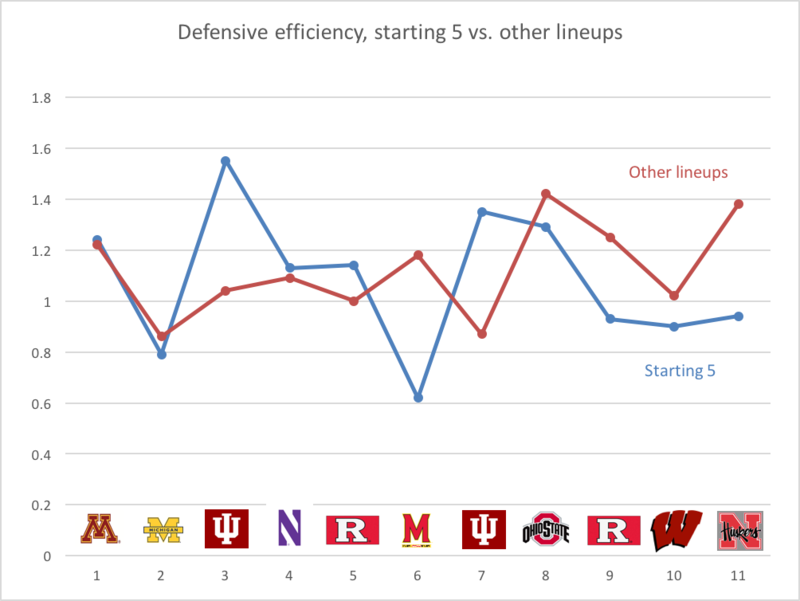 I looked at both offensive and defensive efficiencies for our starting five and our other lineups. Let’s discuss defense first because defense wins championships, or something like that. The defensive efficiencies of our starting five and our other lineup combinations for each game are shown in Figure 2. As you can see, the numbers vary considerably (inconsistent defense, yo) and that there doesn’t appear to be much of a difference between the starters and the other lineup combinations. In fact, when averaged over the entire 11 game data set, the starters actually performed slightly better on defense (1.08 vs 1.12 PPP allowed) although that difference was not statistically significant. There were defensive trends that are worth talking about, which I’ll go into in subsequent articles, but the dramatic difference in effectiveness between lineups was not due to differences on defense. There was a dramatic difference in offensive efficiency between our starting five and our non-starting five player combinations. The offensive efficiencies of our starting five and our other lineup combinations for each game are shown in Figure 3. As you can see from the graph, the other lineups consistently performed better on offense than the starting five, far better. Over the entire 11 game sample, the other lineups scored a very solid 1.09 PPP while the starters managed a mere 0.91 PPP. That is a huge difference. 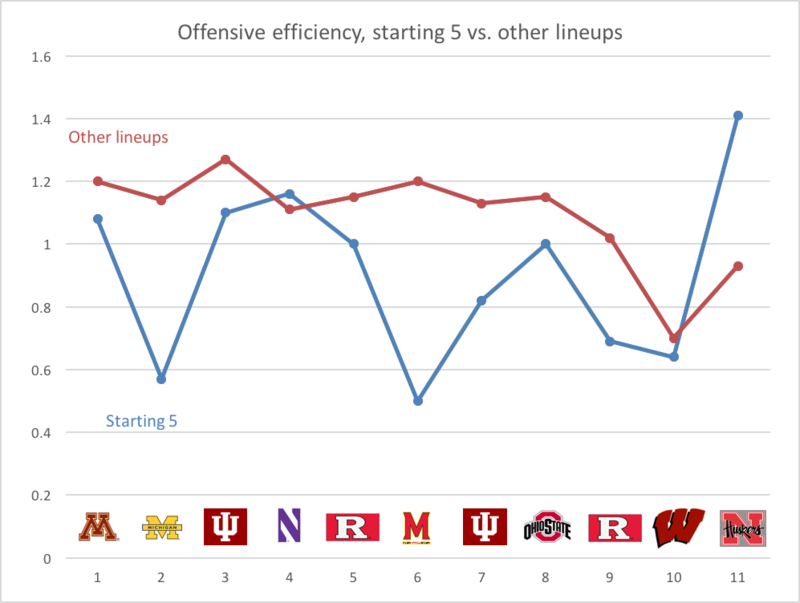 During the last two games, the other lineups’ offensive efficiency plummeted. Prior to that time, however, they put up 1.15 PPP (an outstanding offensive efficiency). In summary, the first thing that jumped out at me from my analysis of the losing streak and the stretch of narrow victories that preceded the losing streak is that our starting five was shockingly ineffective during this stretch of games, relative to our other lineup combinations, and that this ineffectiveness was largely due to problems on the offensive end. Over the course of the year we were a much better offensive team than a defensive one. The same is true, overall, during the 11 games that I tracked. We scored 1.06 PPP on the possessions that I tracked, and that includes the Wisconsin game, which is obviously a huge outlier. Putting up 1.06 PPP against the defenses that we faced is not bad. The team’s main problem was on the defensive end, both during the slump and over the entire year. However, that doesn’t mean that the offense can’t improve. This study suggests, to my great surprise, that our starting five was remarkably poor on offense over the last third of the season and that, if this can be rectified, we could hit another gear offensively. Importantly, each of our starters still had good offensive +/-. It appears as though no individual player was responsible for this trend. For example, while our starting five only scored 0.97 PPP, when Garza was on the floor with a combination of players that wasn’t Bohannon, Moss, Wieskamp and Cook, we scored 1.14 PPP. For each of the other starters, that “non-starting five” efficiency varies from 1.08-1.12, so significantly better than the 0.97 PPP that we get with the starting five lineup combination. It was only when they were all out on the court together that we couldn’t score. Obviously, these problems could simply be due to them having to go up against the other team’s starters or the other team being energized at the start of games/halves. Fran needs to figure out if this issue with the starting five’s offense was part of a larger trend, and how to fix it (a lineup tweak, more set plays at the start of games/halves etc.). Thanks for reading! I will be doing more articles like this during the off-season so, if you are interested in this stuff, please keep coming back because there will be more.